Switch from BB creams to foundations. BB creams are something between a moisturizer and a liquid foundation. They are awesome in summer, but with the cold weather approaching, you might want something more protecting. A foundation doesn’t have to be heavy and full coverage if you don’t want to. There are plenty to choose from with enough coverage and nourishing benefits. See Dr. Hauschka Translucent Make-Up Foundation. Switch from bold & vibrant eyeshadows to more muted, matte shades. Like I said before, this isn’t a rule, but lately, I’ve been catching myself admiring makeup with muted, earthy, and matte colors. See Dr. Hauschka Eyeshadow Palette. Switch from lip glosses to creamy lipsticks. Creamy lipsticks will protect your lips from the wind and harsh weather in general. Recently, I’ve loved Au Naturale Lipstick in Innocence. 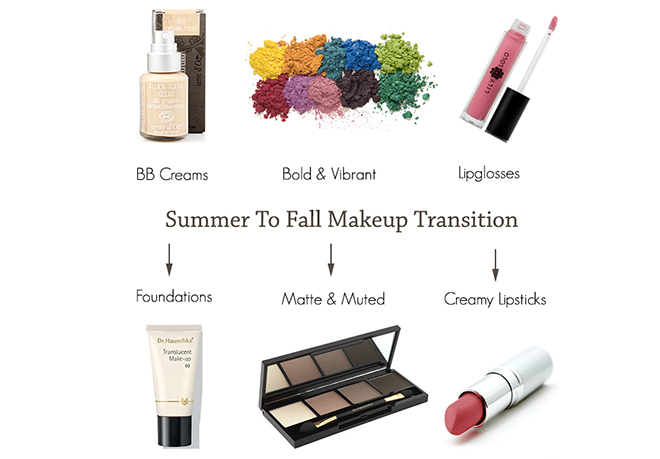 Do you change your makeup routine with seasons? That palette looks like perfect versatile neutrals palette. And loving the lip color. My favorite red hue at the moment would be the Ilia Beauty Lipstick in Bang Bang. The Bang Bang is a stunning color!